Savary Island’s warm water and sandy beaches make it a popular holiday destination. Apart from an ancient granite outcrop at Green’s Point, Savary is a narrow sliver of glacial sediment, essentially a migrating sandbar. 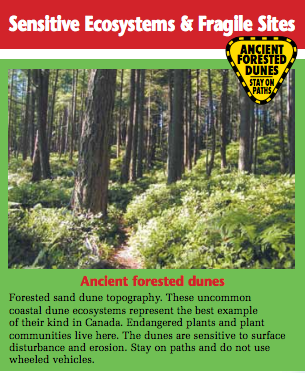 Savary is home to 10,000 year old sand dunes and is the best example of a coastal dune ecosystem in Western Canada. Sandy Savary is also very fragile. The island is eroding at an average rate of .41 meters per year on the south side and .025 meters per year on the north side. The Island, cliffs and dunes are highly sensitive to disturbance. Though only 7.5 km long and 0.3 km to 1.0 km wide, Savary is subdivided into over 1750 small lots, giving it the highest lot density – by far – of any island in the Salish Sea – 9 times greater than Bowen Island and 20 times greater than Denman Island. Savary is reaching critical development thresholds, and support for protecting undeveloped areas and trails are urgently needed now. Savary is best enjoyed on foot or by bicycle. Please leave your vehicle in Lund. Handle Savary with care and enjoy your visit. Click on the "Visitor's Guide" link below for a map of the ecological values of the island and tips on how you can reduce your impact when you visit. Leave your vehicle in Lund Savary is best enjoyed on foot or by bicycle. Parking is available at Dave‘s Custom Parking in Lund (604) 483-3667. Transportation Lund Water & Land Taxi (604) 483-9749 Reservations are required. Be prepared There are no public campsites or washrooms on Savary Island. Cottage rentals, B&B’s and private campsites are available. Restaurants on the Island have washrooms for customer use only. There are no garbage facilities on the Island so please pack out what you pack in. Fires Savary Island is an extreme fire hazard. Fires are banned during summer months in accordance with the Savary Island Volunteer Fire Department. Most Savary cliffs are covered in Scotch broom; this invasive plant produces large amounts of woody fuel and creates a risk of hotter-than normal fires. Please do not smoke on forest trails. Emergency Bring a first aid kit. Island volunteers run an efficient First Responders Unit. In case of fire or medical emergency, dial 911. Water There is no public source of drinking water on Savary Island. There is a lack of data about the quantity of groundwater on the island. Water is very precious. Help us to nurture this essential resource by carefully practicing water conservation. Wharf The public wharf is for pick up and drop off use only. No moorage is available. Please do not leave bicycles on the wharf. Erosion Sand cliffs and dunes are particularly fragile. Please use existing trails and do not remove any vegetation. Please do not play on, climb, carve or build into the cliffs or dunes. Beachcomb with a conscience Beach animals are fragile. Handling them, taking them out of water, or removing them when they are attached to rocks can harm them. Marine life is best observed in its natural habitat. Dogs Dog droppings are a health hazard, please pick up after your dog. Keep your dog under control at all times. Prevent your dog from chasing deer. Do not allow your dog to harass or harm wildlife. Keep wild animals wild The best diet for wildlife is provided by nature. Feeding wildlife reduces their ability to survive on their own. Keep a safe distance from animals and give them a chance to move on. Fishing Harvesting of any fish or shellfish requires a license. Licenses are available online at www.pac.dfo-mpo.gc.ca/fm-gp/rec/index-eng.htm Licenses are NOT available on Savary.